How bad is the situation at Fukushima? On September 7th, in a successful bid to win the 2020 Olympics, Prime Minister Shinzo Abe assured International Olympic Committee members, “The (Fukushima) situation is under control”–only to be contradicted later by senior management at TEPCO. Former Nuclear Regulatory Commission Chairman Gregory Jaczko, when asked for his opinion on the current situation Monday (Japan time) said, “This nuclear accident has released forces that no one can fully control. It will take decades to resolve it.” The Japanese public and the international community are increasingly skeptical of the information being released by the Japanese government about the Fukushima disaster. Independent studies suggest the amounts of radiation released were far above the Japanese government’s official findings. Radioactive materials have also been leaking into the groundwater and the ocean for possibly months. TEPCO is making haphazard efforts to contain the damage. Even after the initial disaster in March of 2011, Japan took months to finally admit that a triple nuclear meltdown had occurred. It will take at least 30 years for the situation at Fukushima to be “under control.” The question that remains is what will happen to the health of those living in Fukushima and Japan while that resolution takes place. The following article is printed in full in the Daily Beast. For reference we’ve added some of the statistical data at the end of this article. The Daily Beast recently obtained unpublished data on birth defects in Japan, which showed a small increase in prevalence rates for 2011—the year there was a triple nuclear meltdown in Fukushima Prefecture. The prevalence rate—the frequency of malformations among childbirths, such as holes in the heart (atrial septal defect)—was 2.43 percent, a number that is still below what is considered a normal figure among radiation experts. The university that conducted the study will not release regional figures. However, several nuclear experts in and outside of the country assert that Japan needs to seriously measure the health impact of its nuclear problems, including birth defects, “with not just annual data but monthly data and broken down by prefecture.”…. On March 11, 2011, a magnitude 9.0 earthquake and a tsunami hit the northeast coast of Japan, which triggered a triple meltdown at the Tokyo Electric Power Company (TEPCO) operated Fukushima Daiichi Nuclear Power Plant. The meltdown released massive amounts of radiation into the atmosphere and the water supply, with some reports suggesting certain types of radioactive materials have been released at levels that surpassed Chernobyl. Earlier this month, Japan’s Nuclear Regulation Authority said radiation readings near water-storage tanks at Fukushima Daiichi had reached previously unrecorded high levels. Near one group of tanks the levels reached 2,200 millisieverts per hour. An unprotected person standing close to the contaminated areas would receive a lethal radiation dose within hours. The data obtained by the Daily Beast was compiled by Yokohama City University, which has been doing studies of birth defects in Japan for over a decade. The 2011 Report on Congenital Malformations notes the prevalence of malformed infants as 2.43 percent, the highest figure since 1999 (1.48 percent). However, the figures for 2010 were 2.31 percent, indicating only a small increase between 2010 and 2011. 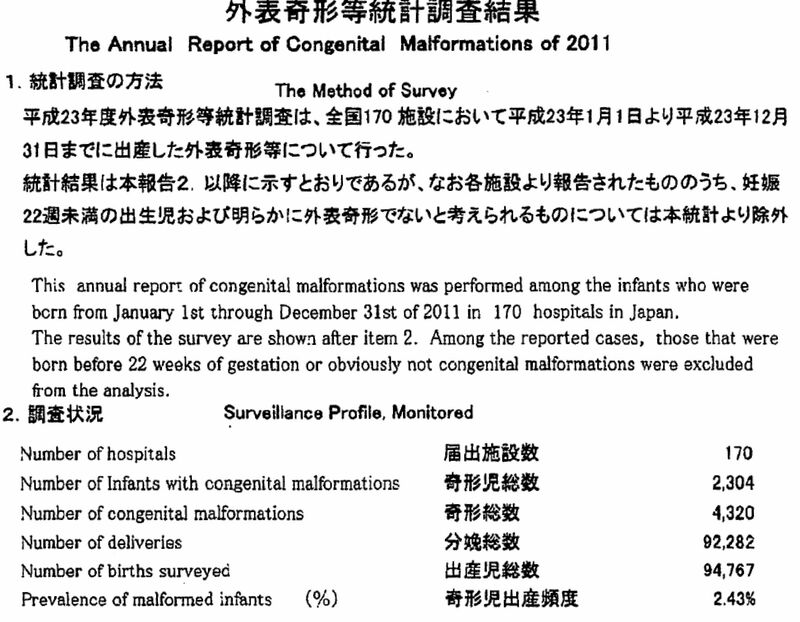 The 2011 report surveys infants born from January 1, 2011, to December 31, 2011, in 170 hospitals throughout Japan. Since 1999, the Yokohama City University has been releasing the statistical report regularly around the month of May, but did not publish the data this year. After repeated requests, it finally provided the 2011 data, which is still currently unavailable to the public. The Center for Disease Control has the following to say about radiation exposure and pregnancy. 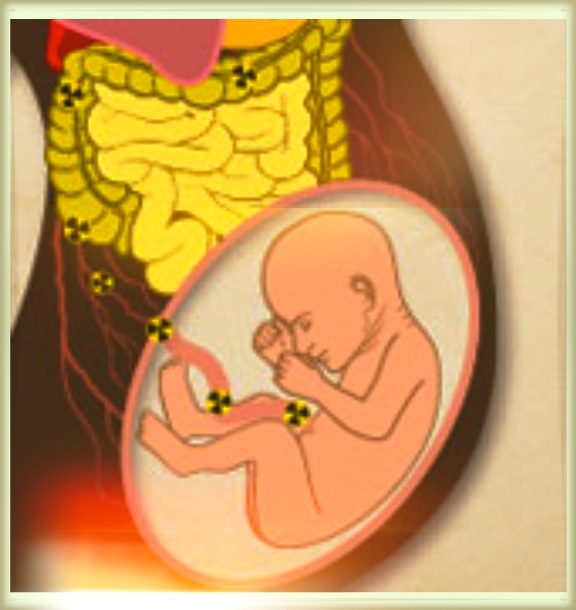 Although anyone exposed to radiation may experience health effects, a developing fetus is the most vulnerable to the effects of radiation exposure. Infants, children, the elderly, pregnant women, and people with compromised immune systems are more vulnerable to health effects from radiation exposure than healthy adults. It is important for everyone, especially these groups to follow protective action instructions and to seek medical attention after a radiation emergency as soon as it is safe to do so. In order to provide some more data, the chart below is a summary of the Annual Report of Congenital Malformations of 2011. We’ve omitted technical explanations. Radiation experts believed that the results could not definitely show a causal relation to the nuclear accident at Fukushima and that regional data and larger studies are needed to assess the health impact of the various radioactive elements leaking from the Fukushima Daiichi Nuclear Reactor. A major cause of birth defects! Must stop and prevent our next generation in suffering from our mistakes. Next Next post: Haruki Murakami Wins The Nobel Prize For Literature!….in Japan. For a few minutes.